Now the hard work is done, why not treat yourselves and your wedding party to a totally relaxing cruise on the Riviera of Ireland, the West Cork Coast. Still too busy? Why not book us for a chill out cruise for the day after the big event. Hop on board at Kinsale Harbour and enjoy a ‘Champagne and Strawberry Reception’ (see details below) while cruising out of the medieval town and setting course for the open waters of Kinsale’s outer harbour. We cruise out to the historic Old Head of Kinsale light house, home to the famous Old Head golf links, while stopping on the way to peep through the caves in Holeopen Bay through the neck of the mighty cliff to the Atlantic Ocean beyond. Keep your cameras at the ready as the scenery is truly dramatic and we are constantly on the look-out for whales, dolphins and basking sharks which frequent these waters. 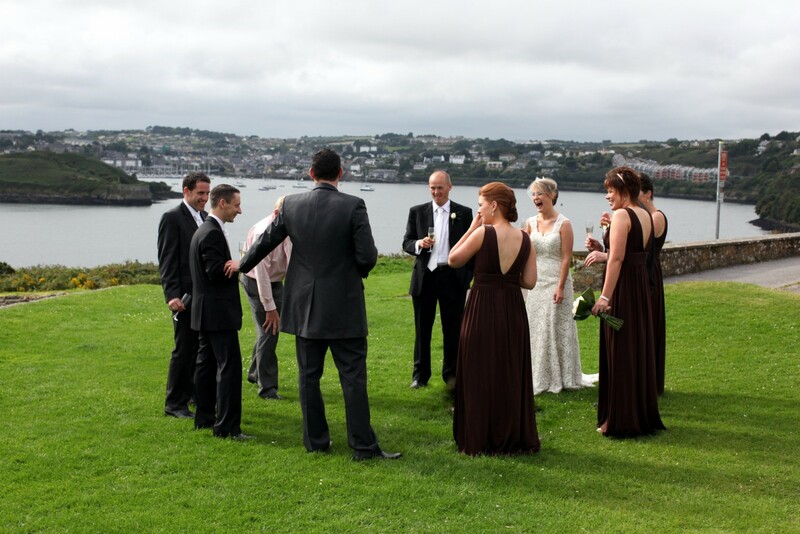 Take family pictures against the magnificent backdrop of Kinsale Harbour, to add a touch of something special to your wedding album. Anchor up in the idyllic Oyster Haven Bay or off the secluded Sandy Cove Island and relish the unique experience of an on-board picnic amidst the rugged cliffs of West Cork. Bring your own picnic or choose our ‘Add a Touch of Luxury Package’ (see details below). Let your host look after you as you soak up the sun, chill out and enjoy each other’s company, while lounging on deck chairs and enjoying the scenery. While cruising back to harbour, enjoy the views of Charles Fort and James Fort and the beautiful town of Kinsale as we slowly head back to shore. Price per charters is €600.00. This price is based on a party of 12 people. if group is larger please contact us for further pricing and charter options. If group is less than 12 people, full boat price still applies. A deposit of 50% is required on booking. We reserve the right to refuse to allow any individual to board the boat under the influence of excess alcohol.